By the early 1970s computers were becoming more important for the banking industry. In these pre-internet days computer data was transferred on cards and tapes by road or air couriers. In 1971 Databank Systems were using NAC to carry the computer data from all the banks in the Gisborne and East Coast area to the Hamilton and Auckland computer centres. NAC’s timetable, however, meant the bank’s full day trading could not be processed overnight. In 1971 the Gisborne Aero Club entered into negotiations with Databank Systems about the establishment of an overnight IFR air freight service from Gisborne for the carriage of computer data. Databank initially envisaged that the service would only operate to Hamilton but, with Hamilton’s reputation for fog and a 3% non-delivery clause in the proposed contract, the Aero Club negotiated for a Gisborne-Hamilton-Auckland service. While Databank’s proposed contract price was not sufficient to cover all the costs for the service the Club was confident that they would attract enough passengers and freight to make the operation viable. The Club initially hoped to begin services at the beginning of August 1971, however, a licence was not issued until early November 1971. Further delays in acquiring a suitable aircraft followed. While the Club awaited the delivery of their Piper Aztec the service began in February 1972 using the Nelson Aero Club’s Piper Pa23-160 Apache ZK-CHU which operated under visual flight rules. 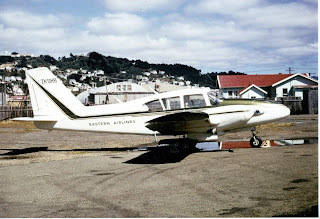 In the last week of March 1972 the Gisborne Aero Club’s 1968 model Piper Pa23-250 Aztec D, ZK-DHB (c/n 27-3735), arrived in New Zealand. Over the next three weeks the aircraft was prepared for service and crew trained. The Aztec took over the service operating the IFR service on the 18th of April 1972. This commercial division of the Aero Club’s activities was operated under the Eastern Airlines banner. Databank required flights to operate Monday to Friday northbound with the return flights operated on Tuesday to Saturday mornings. 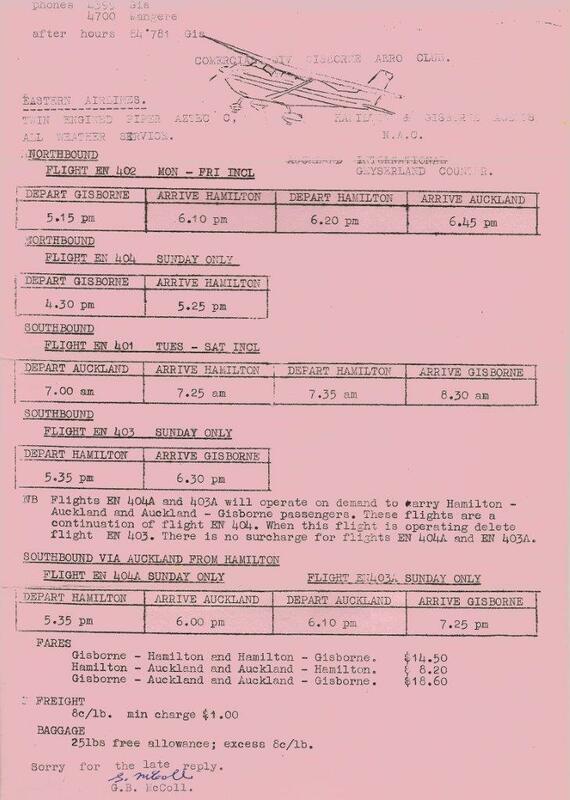 In addition to the Databank services a late afternoon Sunday return service was made to Hamilton with an extension of this service flown to Auckland if there were Hamilton-Auckland or Auckland-Gisborne passengers offering. The Gisborne Aero Club’s operations manager and chief pilot, Mr V J Bishop, was optimistic about the future and told NZ Herald the company would put on more services if it well and that “we envisage expanding to three aircraft, possibly getting the second by the end of this year.” In addition to the regular air service the Aztec was modified to take specialised equipped with stretchers and oxygen facilities making it one of only two It is also A-category air ambulance standard aircraft in the country at the time. It was also used for general charter work. The initial outlay of $45,000 was a huge investment for the Aero Club. Eastern Airlines were also required to charge 10% more than NAC which also flew the same route which made the service less attractive for passengers. Unfortunately for the Aero Club passenger loadings and additional freight levels were not adequate to meet the shortfall between the Databank contract price and the operating costs. Soon the Club was in serious financial difficulties and this ultimately led to the appointment of a liquidator who wound up the club and Eastern Airlines. 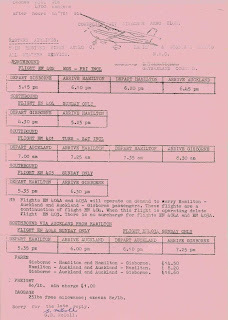 The final service was flown Gisborne-Auckland-Admore-Gisborne on the 20th of Oct 1972 followed by a 15 min "Goodbye Gisborne" low level flight later that day. Thanks for that... the post has been updated.